Jenn from Bread + Butter was kind enough to ask me to host the next BSI (Blogger Secret Ingredient). I was more than thrilled! Below you will find a list of past blogger hosts and their secret ingredient of choice. *Make or create a recipe that uses the chosen ingredient by Sunday night (June 14th, 2009). *Comment on this post so I know that you've entered. So, everyone join me and get cookin'! I can't wait to see what we all come up with! Ooooo....Awesome choice!!!! Now I've got think of something with watermelon!! I would have been so lost! This sounds like so much fun. AND I just bought a big watermelon. Hmmm. . . . I am putting my culinary thinking cap on! Thanks for hosting this. I love watermelon... I don't have any fab ideas though! I just wanted to let you know that I tried one of your recipes (chicken gyros) and refrenced you on my blog! Oh how interesting! You're so creative. I can't wait to see what you come up with! How about some Watermelon Salsa! I wouldn't have known what to do! Great ingredient choice! 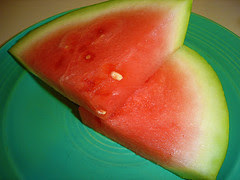 I've seen some very interesting recipes with watermelon this season already, can't wait to see more! Wow - how cool. I can't wait to see what you come up with for watermelon. YUM! So I was really eating watermelon just 15 minutes ago. It's not the same as a cupcake but oh well. I cant have my cake and eat it too I am guessing! Also...as an after thought. I am going to try to make a Spanish Tortilla. As in the egg and potato dish. We have so many of these darn chicken eggs I have to use them up, and they just keep coming. One tortilla takes 8 eggs. This is the Tapas kind of preparation. Wish me luck. OK...posted and linked!! Can't wait to see what some of the other entries are! so excited to see what everyone comes up with! I made some icy cool Watermelon Ice Cream this afternoon! I posted my BSI recipe tonight - watermelon bbq sauce! Great idea to pick this ingredient, especially in the beginning of summer! I just posted my watermelon recipe (Ginger Watermelon Granita). What a fun ingredient to work with!